It’s no secret that Bryan Murray and his management team value character in the players on their team. Whether or not that’s the right approach to making a winning team on the ice is up for debate. What isn’t, is the fact that the Ottawa Senators are equally important to the community off the ice as they are on it. While we may complain about players and their performances, it’s sometimes to easy forget how big an impact they have off the ice, especially in a city as small Ottawa. The media does a good job of covering the major charity contributions by players. There’s Bobby Ryan’s recent purchase of a suite for CHEO and Kyle Turris’ involvement with the Capital City Condors. During the summer, many of the players who are in Ottawa volunteer their time to offer their star power to the various charity endeavors around the city. These have included the likes of Jean-Gabriel Pageau, Cody Ceci, Patrick Wiercioch, Zack Smith, Clarke MacArthur, Mark Stone, Marc Methot, and Turris. Even during the season, the players find time in their busy schedules to help out charities. Karlsson hosted an event for Sit With Me, a dog rescue and dog adoption organization. Karlsson also joined Methot to host the 8th Annual Martini Madness Night to raise funds for Chron’s & Colitis Foundation of Canada. Mike Hoffman and Smith helped out Stop Concussions. Mark Borowiecki aided the Ottawa Fire Department with their boot drive for muscular dystrophy. Chris Neil has lent help to many various charity events over the years including the Run for Roger’s House and Roger’s House. Likewise, Chris Phillips has lent help to the Snowsuit Fund and helped launch 24 Hr of Tremblant. Over the course of the year, you’ll see plenty of players from the Ottawa Senators directly involved in charity endeavors. However, it’s also the little things that matter. These actions may only affect a small number of people. They may not garner any media attention, but they certainly matter to those involved. For example, over the years in Ottawa I’ve seen or heard of various players from the team join kids on the outdoor rink during the winter or even on the streets throughout the year. Those are the types of moments that will last forever for those kids. I’ve seen plenty of these actions first hand as well. Players like Turris, Smith, Phillips, Ceci, and Methot will always make the effort to stop outside the player parking lot following home games (regardless of a win or loss) for autographs. It’s only a couple of minutes, but I’ve seen out of town Sens fans days get made from that small amount of time. Since arriving to Ottawa, Ryan has easily been the most accessible player from the team. Every season he hosts several meet and greet sessions through various local partnerships. Recently, he held one at Source for Sports where he was scheduled to be there from 6:00-7:30. The day of the event, the crowd grew quickly, but Ryan didn’t rush with any of the fans, taking his time to chat and pose for photos. The line was still long with 7:30 approaching and an employee began telling the line that they might not get to meet Ryan. He wouldn’t have any of that though. He informed the employee that he would stay until everyone met him. He ended up staying around 30 minutes longer than he was scheduled, getting through the remainder of the line. It’s true when they say Bobby’s a class act. 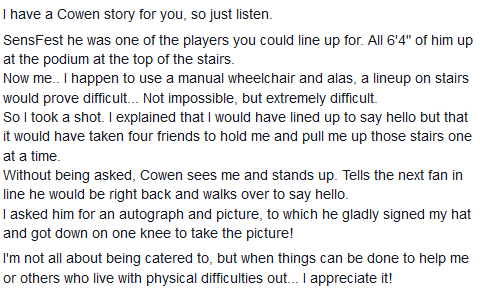 I’ve also met Methot several times, and there was one moment that stuck out to me. It was seeing him greeting fans by their names. It’s incredible to think of an NHL player taking the time to remember multiple fans by name for the next time he might see them. Now, it might not sound like that big a deal, but to those fans it may very well be. I’ve followed social media long enough to know that little actions like that can turn a person’s day, week, month, or year around. There was also a story I saw from Kyle Humphrey a while back in September. As Sens fans or Ottawa residents, you may recognize the name. I’ll let him tell the story. On December 2nd, the Ottawa Senators did their annual CHEO Christmas visit (and is a video you should definitely take the time to watch). While that is a highly publicized event, what followed wasn’t. Phillips and Ceci followed that appearance by attending the Candlelighters Christmas party. If you haven’t heard of Candlelighters, they provide programs and services to young cancer patients and their families. Stefan Wolejszo had this to say about that event. We missed going to see the Sens players at CHEO, but at least Sparticat will be there tonight. We are a bit late heading out. My daughter made Sparticat a Christmas ornament and has now decided it needs a card as well. While a lot of us may not be fans of certain players on the ice, I think it’s safe to say off of it, every one of us is a fan of the entire team. From the big charity events, to the smaller charity events, to the actions not seen on camera, the Ottawa Senators are a huge part of the community. I’d love to hear any personal stories involving the team you have to share, feel free to comment below!